Dealing with the therapeutic impasse is one of the most challenging tasks faced by therapists. 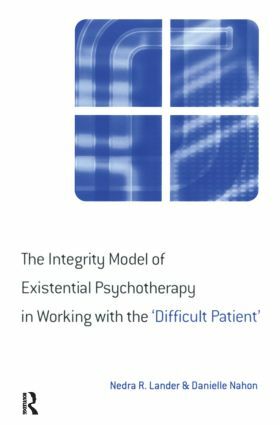 The Integrity Model of Existential Psychotherapy in Working with the 'Difficult Patient' describes how the Integrity model of psychotherapy provides an original solution to dealing with difficult issues such as resistance, acting out, counter-transference, guilt, value clashes and cultural diversity. This book provides a provocative and insightful presentation of the subject of impasses, as well as dealing with associated issues including the role of values in psychotherapy, community, spirituality, and therapist responsibility. It will be of great interest to counsellors and psychotherapists.